We don’t like pain, and we dread it coming into our lives. But God uses our pain and trials for our own good. He uses affliction and suffering to mold us into the image of Christ, refining us in the fire and burning away impurities. No one ever asks for tragedy or pain, but we often look back and are thankful for the ways that God uses those situations to shape us. The patience, perspective, and inner strength we receive are blessings that come from the Father through even our worst times. But this molding doesn’t have to be restricted to health problems, financial issues, or family emergencies. 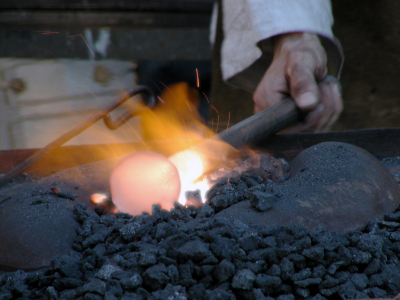 The refiner uses many different kinds of fire and many different levels of heat. We serve a God who can use our greatest tragedies as tools in his hands. He can use minor discomforts. He can even use painful situations that arise as a result of our sins. Perhaps there’s a hidden blessing in our busyness. Perhaps God can use our hectic schedules and high stress levels as a way of refining us. When we get busy, we want to get out! We want that next trick or tip or strategy to help us get in control of our schedules. That’s great: I hope this blog can provide ways for us to take charge in those areas. But don’t shortchange your sanctification. We don’t want to be so eager to ease the pain that we neglect any instruction from the Father. We may think busyness is just about too many errands to run. But busyness is often just the symptom of a deeper problem. Let’s take time to see if God has something to say to us in the middle of the situation. What could our busyness reveal to us? Does our busyness reveal any idols in our life? Are we busy because of our pride? Do we feel more valuable if we’re busy? It could be that we find value in what we accomplish and what we perform, so we cram our schedules full of activity. Are we working hard trying to bring as much glory as we can to ourselves? Are we showing a lack of contentment with where God has placed us by feverishly striving for more money, luxury, fame, or influence? Are we afraid to delegate or outsource because we think no one else could do things the right way? Is our busyness an indicator that we are too in love with the world? Are we seeking to draw closer to him in this time? Or are we in danger of being like the thorny ground in the Parable of the Sower (Luke 8:14): where the “cares and riches and pleasures of this life” choked the seed of faith? Could God be using this situation to remind us of our own finite nature – that we can’t take it all on and do everything? Could God use our busyness to show us that only he is all-sufficient and infinite? Do we realize our dependence on him? Do we believe his ways of time stewardship to be best? Or by repeatedly ignoring his ways, are we essentially telling God that our way is better than his? Are we just going with the flow in life and letting the status quo fill up our schedules – or are we actively taking charge of our circumstances? Do we want to change – but starting tomorrow, or next week, or next month? Do we realize the importance of stewarding our time well – or do we forget that God is the owner of our time? Do we just feel really busy because we have an aversion to hard work and are in love with comfort and ease? I was praying about what God wanted to show me through my busyness. And I’ll be honest: he showed me that I was prideful and working too hard to try and prove things to myself.